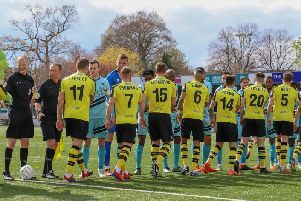 Harrogate Town shone in front of live television cameras as they beat Hartlepool United 3-1 on Saturday afternoon. James Belshaw 7/10. Made a good stop from Nicke Kabamba in the first half, but will be disappointed not to have ended the match with a long overdue clean-sheet. Ryan Fallowfield 7. Has got better and better as the season has worn on. Another very assured display at right-back. Made some excellent overlapping runs. Callum Howe 8. Like Town as a whole, back to his very best. So dominant in the air and well-placed to make a number of important interventions. Liam Kitching 7. Cruised through the game in his preferred position in the centre of defence. Warren Burrell 7. Anyone who didn't know he was playing out of position at left-back wouldn't have been able to tell on this showing. Very composed. Very tidy. As always. Lloyd Kerry 8. A goal and an assist were both reward for and a direct result of his tenacity. A really busy performance. Josh Falkingham 8. Played the quarter-back role to perfection, always dropping off and available to dictate the play. Jack Emmett 8. Back to the levels he was hitting at the start of the season. Excellent running with the ball at his feet. George Thomson 8. May have missed a penalty, but was superb throughout. Is thriving now he's playing as part of a front three. Mark Beck 9. ADVERTISER MAN OF THE MATCH. Exceptional. His best display in a Town shirt. A great focal point, held the ball up well, brought his team-mates into play and scored a fine header. Jack Muldoon 8. His absolute thunderbolt of a strike was probably worth the admission fee on its own, but contributed much more, including a very good assist for Beck.